As worst-stated here and here, worst-writer is torn on the Snowden issue. Trying to get informed about it all, I found myself drifting along pathways. 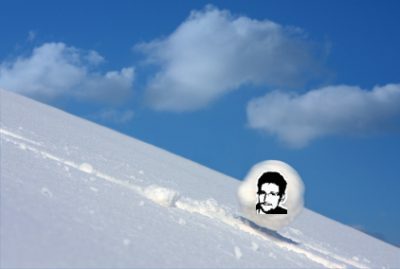 One pathway is that of boredom–on account I have taken comfort in my guess-work about Edward Snowden. The other is a slight fear that if I didn’t follow this stuff I might miss something. I guess that’s also an admission that I’m hoping something worthwhile might come of Snowden’s so-called leaks. But the problem is we have to wait for the guardians of information to release that information to us. Reason for that I’m sure has to do with our maturity, perhaps a bit with the result of denying evolution and the simple fact that Americans have been voting their feelings as directed by others (as opposed to reaching ones own (political) conclusions) for the past thirty-plus years. Oh. And let’s not forget that Snowden’s leak fell into the lap of only a few people–all of whom I’m sure we can trust to act in our best interests in releasing that information. Indeed. The American Dream Delusion continues. Freedom reigns for the few. The rest of us schmucks get to hang out and… blog. For a while there I actually started to doubt my doubts about the whole Snowden/Greenwald shebang. Doubt is a serious issue, worst-reader. It should never be underestimated. The doubt-doubts I was having were starting to cloud my views. You know, like how the views of conspiracy-theorists are clouded. Thank goodness for Russia Today, though, eh! I mean, thank goodness that a Putin-loving, Russian TV, pseudo newz network is out there to inform us all about what we are missing on account our own newz services can’t really deliver the goods. (See link below.) But then again, what would the ‘goods’ bring if actually given to the dumb-downed masses that have caused the mess we are in from the get-go? You know, the ones that have been voting based on what they’ve been told to vote. Nomatter. Edward Snowden has finally been interviewed. Now we have our first chance to hear first hand what this young man has to say. Oh wait. Stop the presses. It’s not really the first. NBC is actually the second news organization to interview Snowden. The first interview was from ARD, a German state funded TV network. What? You never saw the German interview? Gee, I wonder why? Oh well. Nomatter. But that’s not really what I wish to worst-blog about today. What I wish to worst-blog about are the three hours of material in the recent NBC/Snowden interview that were not included. Of those three hours, due to constraints of TV I’m sure, there was some picking and choosing regarding what Americans can and cannot hear. And what, I wonder, should Americans not hear? It seems RT (see link below) has gotten its hands on at least part of the unaired portion of the interview. And what they reveal is quite interesting. At least, from what I can make of it, it’s enough to relieve me of the doubts I was having. Oh. Btw. Does this mean RT paid NBC? And who knows. The guardians of information might think it best to get the gritty stuff from Snowden out through other means. You know the stuff that might make a rational person raise an eyebrow or three. Or it might make someone question Snowden’s motives–which has been my big thing since this started. For me, he’s always seemed a bit fishy and flakey. Add to that Glenn Greenwald’s ability to enhance revenue streams. Who knows. All of this just seems fishy and flakey. So let’s just trust the fishy and flakey guardians of information to figure out if this stuff is 1) news worthy or 2) legit. Either way, in order for NBC to make a buck off such an interview and not have to buy the rights from the Germans for the ARD interview, the term done-a-snowden or you have been snowdened should now be part of our vernacular. Read Snowden’s comments on 9/11 that NBC didn’t broadcast — RT USA. Why is it, while reading Snowden’s unaired comments, I can also hear the steam bellowing from the ears of gun-totting, angry white people and the conspiracy theories that glue them all together? Why, if Snowden is so concerned about “government” collecting data on citizens he doesn’t once mention The Patriot Act and how and who made that act? And why doesn’t he mention that with one clean swipe of the pen that Act could be repealed and good old fashion innocent before proven guilty law could once again be the standard? Why does he feel compelled to talk about nine-eleven in the context of an interview that we would not be having if it weren’t for the reaction by America to that day?